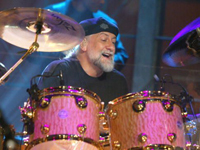 Mick Fleetwood is best known for his tremendous success as the drummer of Fleetwood Mac, the wildly successful band he co-founded in 1967 with fellow John Mayall alumni Peter Green (guitar) and John McVie (bass). The turmoil of the band’s meteoric rise to superstardom is well-known and documented in its own entry; Fleetwood himself eventually lost his marriage after it was discovered in 1973 that his wife was having an affair with Fleetwood Mac guitarist Bob Weston. After the supporting tour for 1979′s Tusk, Fleetwood recorded his debut solo album, The Visitor, which was released in 1981 and displayed the drummer’s interest in worldbeat. After the 1982 Fleetwood Mac album Mirage, Fleetwood cut a second solo record, 1983′s I’m Not Me, which featured cameos from several Fleetwood Mac members. Fleetwood Mac went on hiatus until 1987, when Fleetwood’s declaration of bankruptcy prompted the reunion LP Tango in the Night; even Lindsey Buckingham was persuaded to join in, albeit only in the studio.